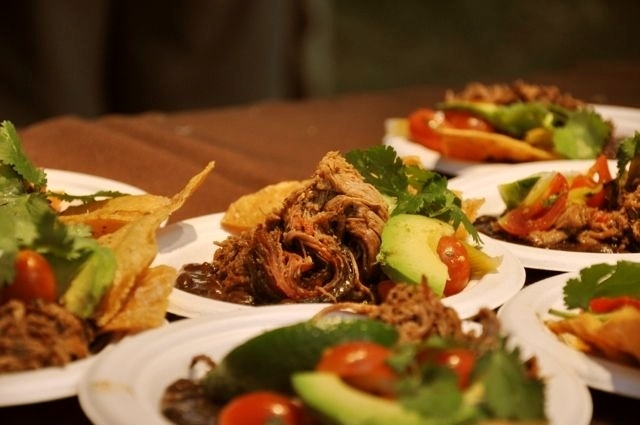 Beef tacos at the 2012 Live Fire celebration of beef supremacy. With the weather turning (in theory) warm and sunny, the food events are multiplying like the proverbial bunnies. From the crown jewel Austin FOOD & WINE Festival to Austin Restaurant Week and Central Market’s Passport to Brazil, April offers us one food event after the other. And while I think you should consider all events equally, these five stand out this as as particularly worthy of having a spotlight shined on them. Live Fire – Beef Supremacy and Beef Mastery: The Austin Food and Wine Alliance is hosting their annual celebration of beef on April 25 as the kick-off event for the Austin FOOD & WINE Festival. Head on out to the Salt Lick Pavilion to find out how local and visiting chefs like Rene Ortiz from Sway, Tatsu Aikawa from Ramen Tatsu-ya, Jason Dady from Jason Dady Restaurants in San Antonio, and Randy Rucker from Briar and Bramble in Houston will make beef dance on your taste buds. All proceeds will benefit the Austin Food and Wine Alliance culinary grants program. The Wine Down at ACL Live: Thursdays this spring enjoy the lovely weather, wines from Rex-Goliath, live music, and nibbles from area restaurants. I recommend you get a group of friends together for the music and wine then head out to a nice dinner in the 2nd Street District. Friday may come a little earlier than expected but it’s a price worth paying. Children’s Picnic and Real Food Fair: On Sunday April 7 help your family build strong connections to local food and food producers at this afternoon celebration of all things real food. Bring a picnic or buy one from the farmers and producers at the event, then settle in for fun and games. What a great way to spend the afternoon. Gazelle Foundation Fundraiser Dinner: As a runner with Gilbert’s Gazelles, this April 11 event is near and dear to my heart and I hope it can be the same for you. The Gazelle Foundation raises money to bring fresh water to families in Burundi, one of the poorest countries in Africa. The price of a ticket to this dinner will bring fresh waters to families for life and you’ll enjoy an evening of good food and conversation with like-minded Austinites. Foodways Texas, Our Barbecue, Ourselves: This year’s Foodways Texas Symposium takes a long, hard, tasty look at barbecue’s connection to Texas culture and history. Pitmasters including Aaron Franklin and Wayne Miller will join look food experts to discuss, for three fulls days on April 4 – 6, exactly what barbecue means to Texas. And yes, there will be tastings, many of them. Which April events are you most excited about? How will you pace yourself?